So many times I hear things like “I wish I could sew” or “I have my grandmother’s machine, but I don’t know how to use it” or “One day I’ll learn.” I’m excited to announce that today marks the start of a new series on my blog: Sewing 101. 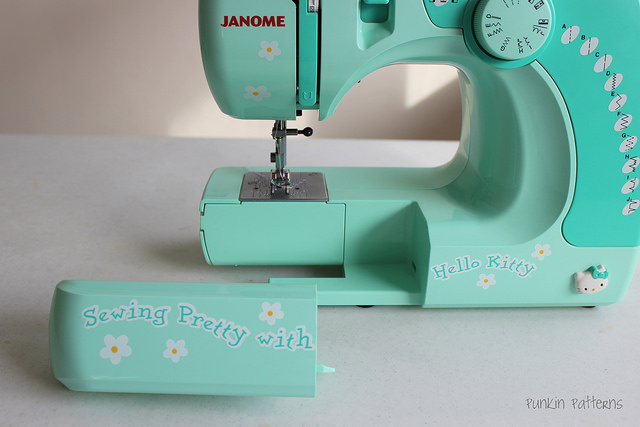 Getting to know your sewing machine. 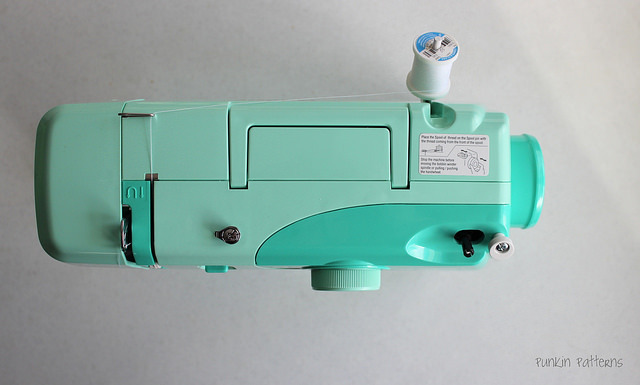 Every sewing machine is different, but the same. Think of it like a car. You can get a used one, an antique one, your basic model, the top of the line luxury model or something in between – great for the family. 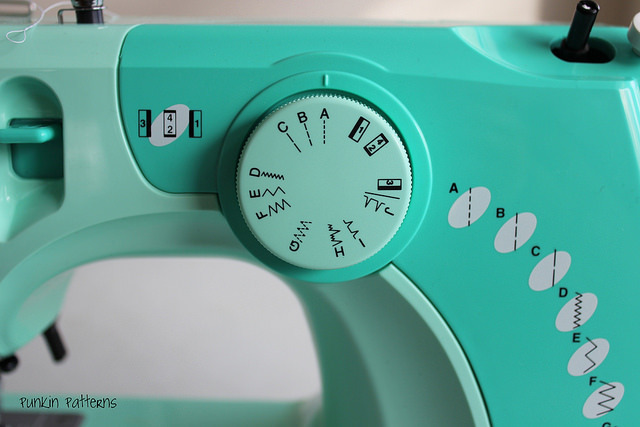 They all get you from A to B (I mean sew), but they also have different features, top speeds, and feel different as you sew with them. And yes, just like a car, certain machines are built better than others. You don’t need a fancy machine to start. Something simple will work. Learn what you need and you can always upgrade later. 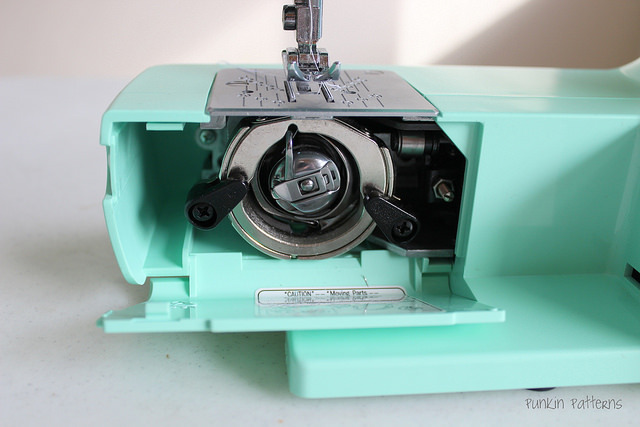 The two (working) sewing machines I have in my house are very basic. 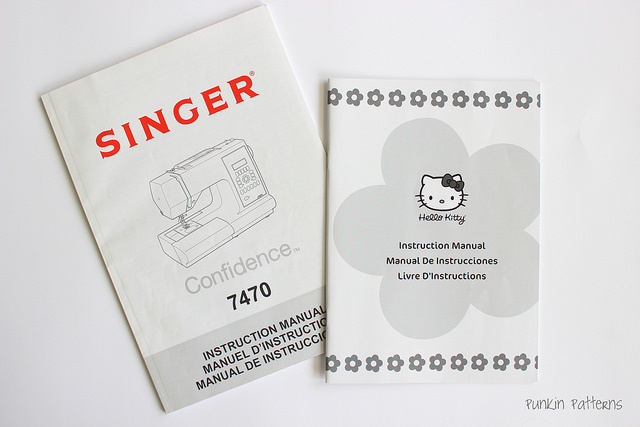 A Singer Confidence 7470 and a Janome Hello Kitty machine (which belongs to my six year old). Both get the job done, but have very different feels. 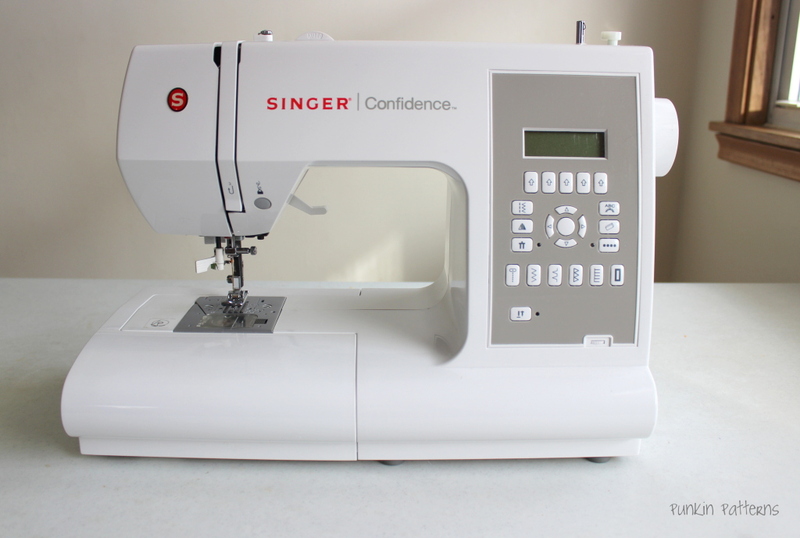 I do all of my sewing on the Singer — even the quilting. My singer is not a the top of the line machine, but it is really nice. It works great and has all the features I need. And my daughters: It is in fact a 3/4 size machine. It is super cute and just the right size for her, but I can foresee it as an easy travel machine, because we all know it’s so hard to go on vacation without your sewing machine. First we’ll talk about the Singer. 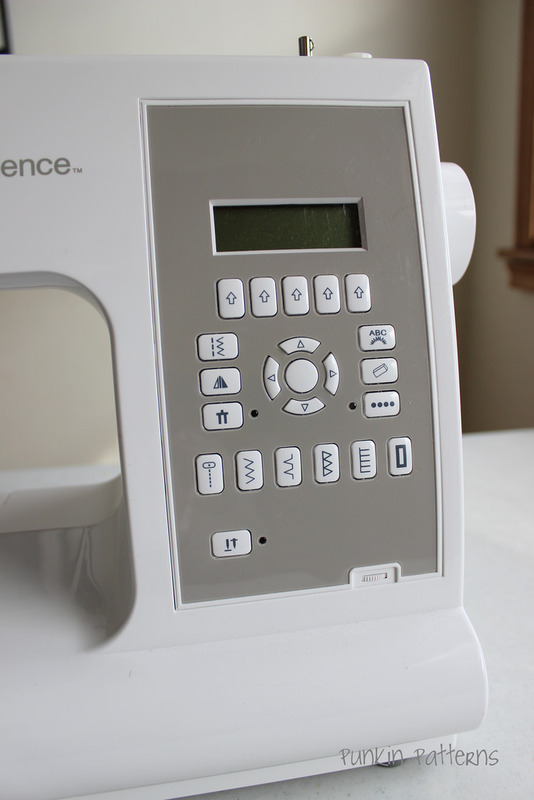 This machine has an electronic stitch controller — It has a lot of stitches pre-programmed in. Most I never use, but they are fun to have. This panel also controls the stitch length, width, position of the needle (since it can be moved left and right a bit) and my favorite button (the bottom left) — the needle up/down button. 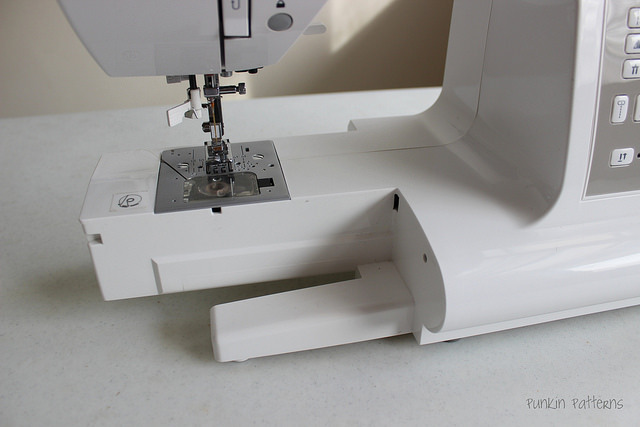 On this machine, when the button is selected, when you stop sewing, the needle is always in the down position – which is great when you want to turn a corner or just pause during sewing and not have your fabric move. The hand wheel moves the needle up and down manually when you turn it. Power turns it on/off. The cord sockets is where the power cord and foot pedal get plugged into. The thread tension controls how easily (or not) the thread goes through the machine. Changing this helps get the perfect tension when sewing. 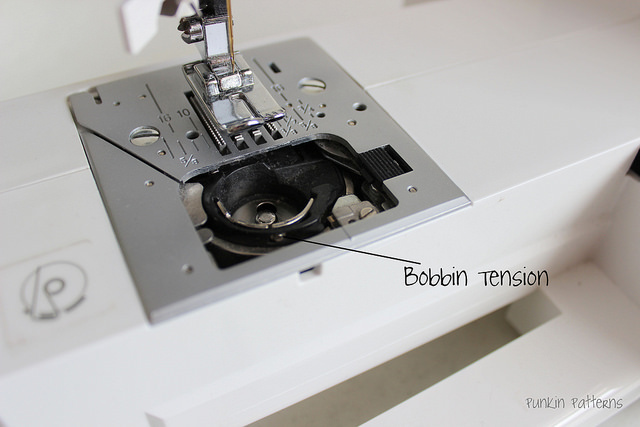 The bobbin winder can be used move thread from the spool onto the bobbin. Getting a closer look at where the needle is we can see there are a lot of parts. The foot on the machine is called the presser foot. This sits on top of the fabric as it goes through the machine. (There are many different types of presser feet, each with specialized functions which we’ll talk about in a future post.) The presser foot is raised and lowered by using the presser foot lever or lifter. The feed dogs move the fabric through the machine. 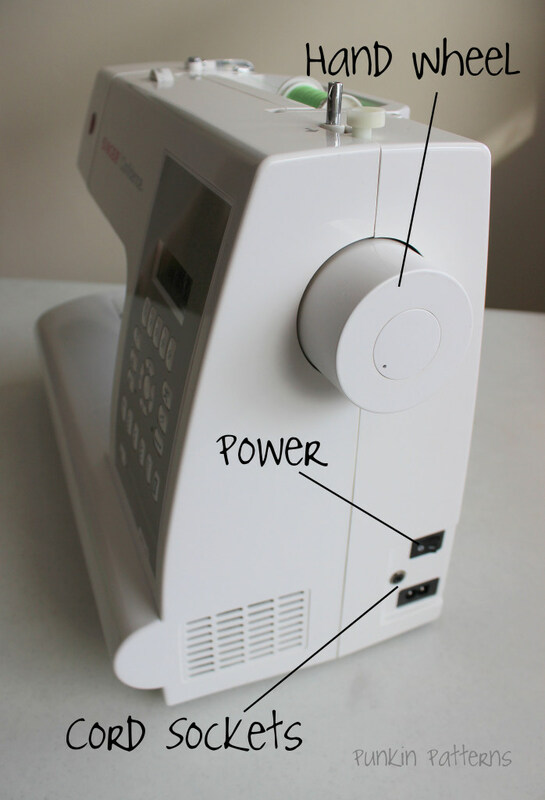 The reverse stitch button makes the feed dogs move in the opposite direction, so that you are sewing in reverse, which locks your stitches in place. The needle clamp screw holds the needle in place and the automatic needle threader helps you thread the needle. The seam guides on the needle plate are very useful. They help you get whatever seam you want by lining up the fabric edge to that line (as long as the needle position is centered). 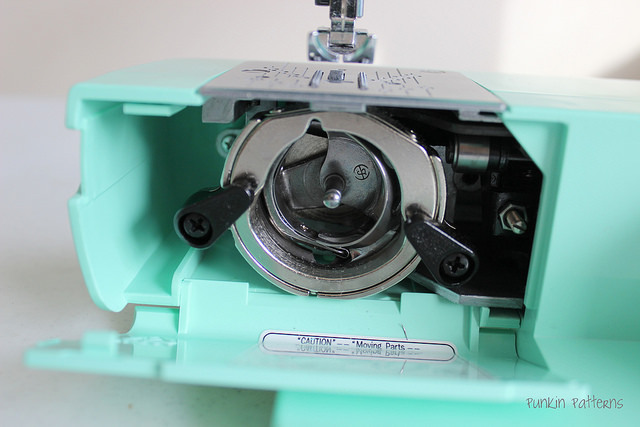 On this machine, it has a drop-in bobbin with a clear cover. I LOVE this feature. I can peek at it and see how much thread I have left on the bobbin. 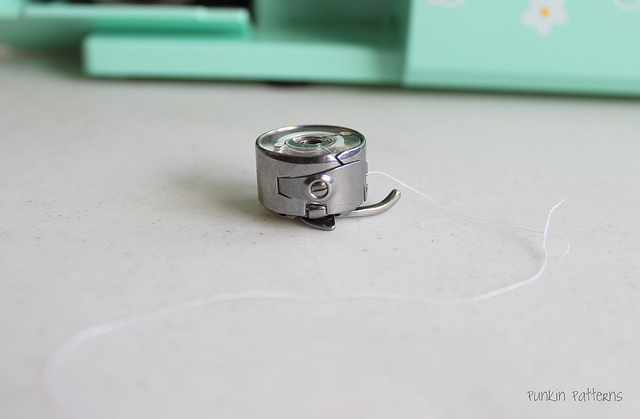 I hate when you’re sewing and suddenly you run out of bobbin thread. Having a transparent plate lets you see if you’re about to run out. 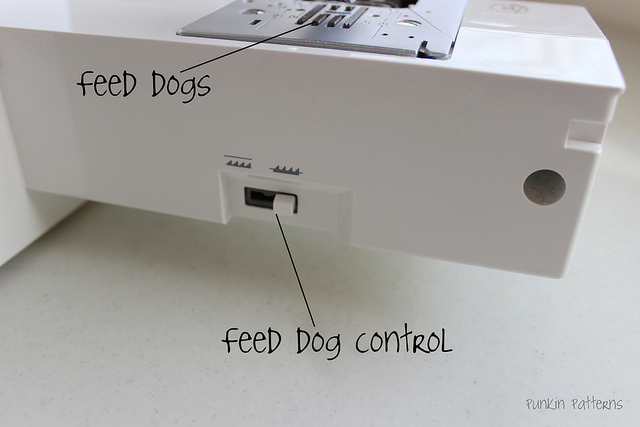 Another nice feature on some machines is the ability to lower the feed dogs. When the feed dogs are lowered, you will be able to freely move the fabric through the machine. 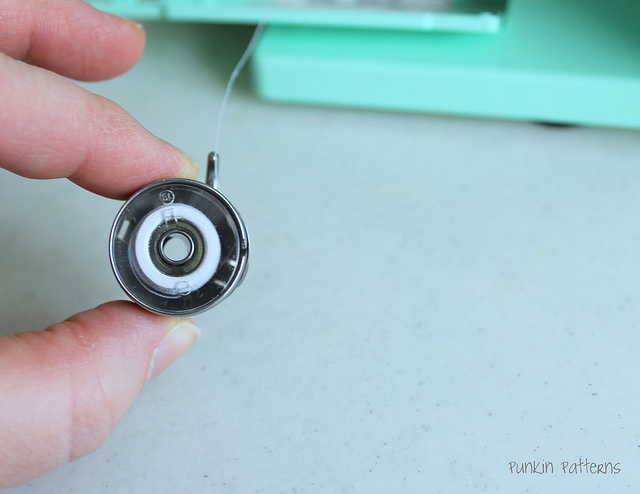 You’ll need this feature if you ever want to do free motion quilting. 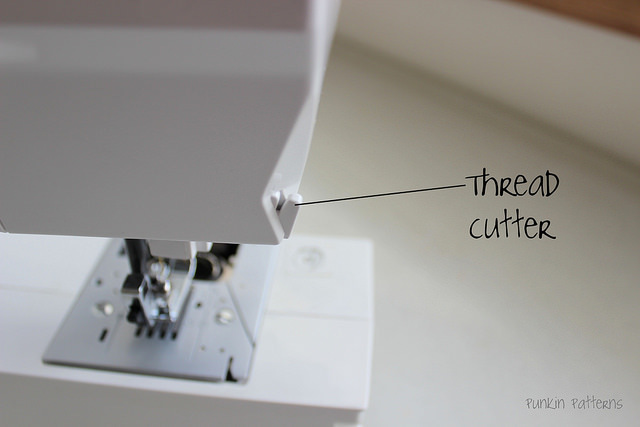 A built in thread cutter is also a very useful feature. Most extension tables have some sort of storage. 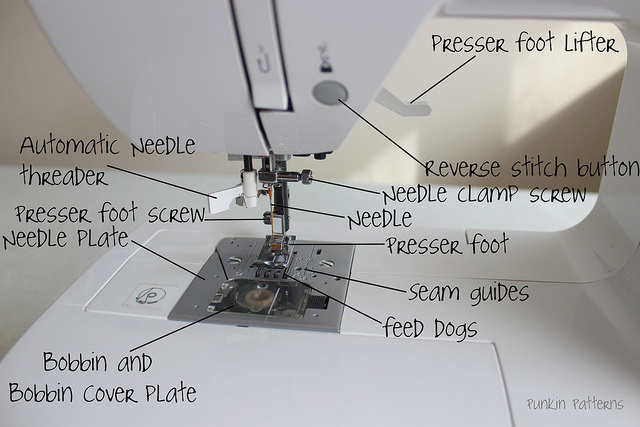 I usually store a few of the feet I use most often, a seam ripper, a few extra bobbins and a screw driver. 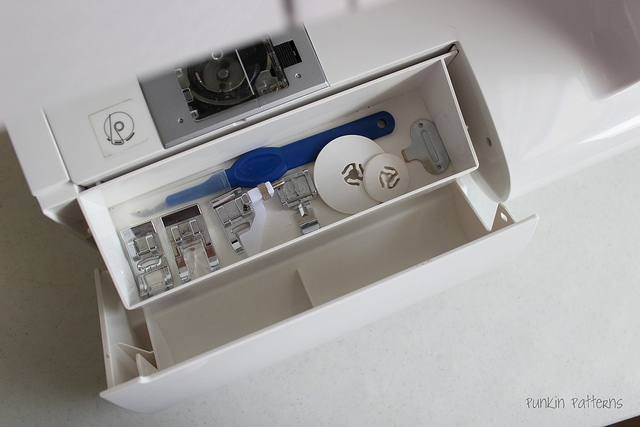 The extension table can be removed to use the free-arm for sewing small tubed projects, like sleeves on a shirt. This small screw is the bobbin tension. Adjusting this tension is very, very tricky and should really only be done by a sewing machine repair shop as it’s really difficult to get it adjusted correctly. The smaller Janome machine has only a small handful of stitches. 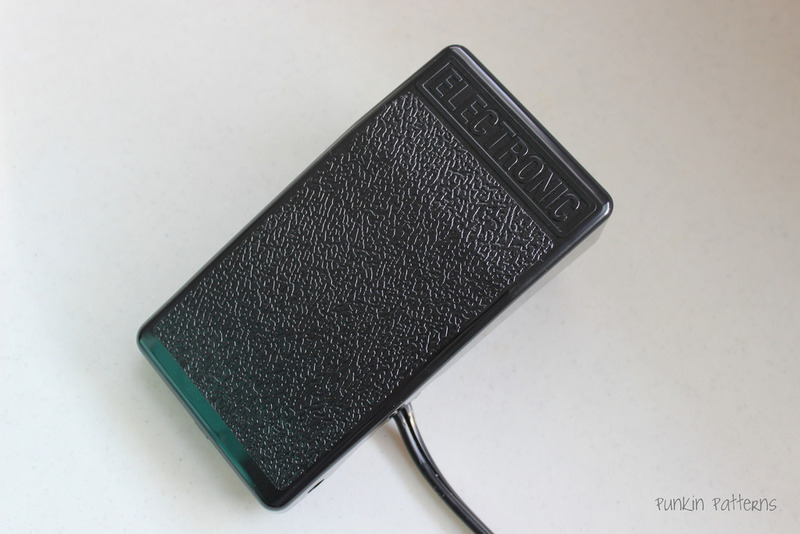 Instead of a electronic stitch controller, it just has a small dial you can adjust. It looks pretty much the same as the fancy one, just with less bells and whistles. It has no thread cutter. You can’t lower the feed dogs. It has a very small storage space in the extension table. And the bobbin access is a bit different. It’s much more hidden and as a result, it’s a bit more of a mystery when you’re going to run out of bobbin thread. As I mentioned, all machines have similar features, but some have a few really nice features. 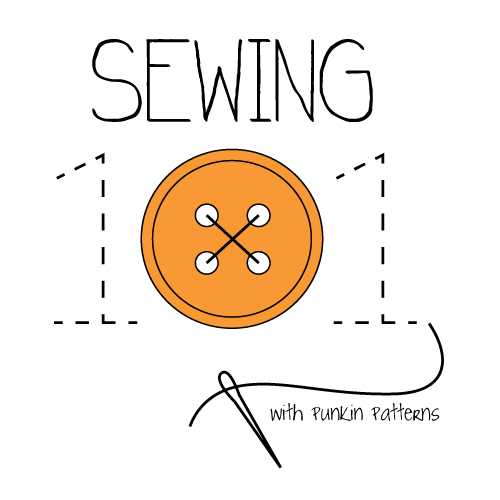 As you sew more, you’ll get to learn what features you really would benefit from or find useful. 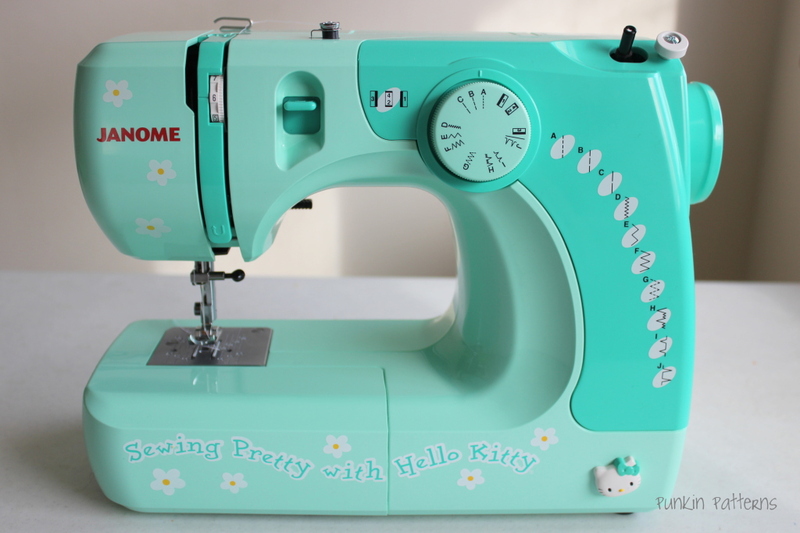 You’ll figure out what you like or don’t like in a sewing machine and if you want a simple, sturdy machine that only does straight stitching or a machine with all the bells and whistles or if you land somewhere in between. Read the manual and test it out. By far the best way to get to know what your machine can do is to read the manual and practice. 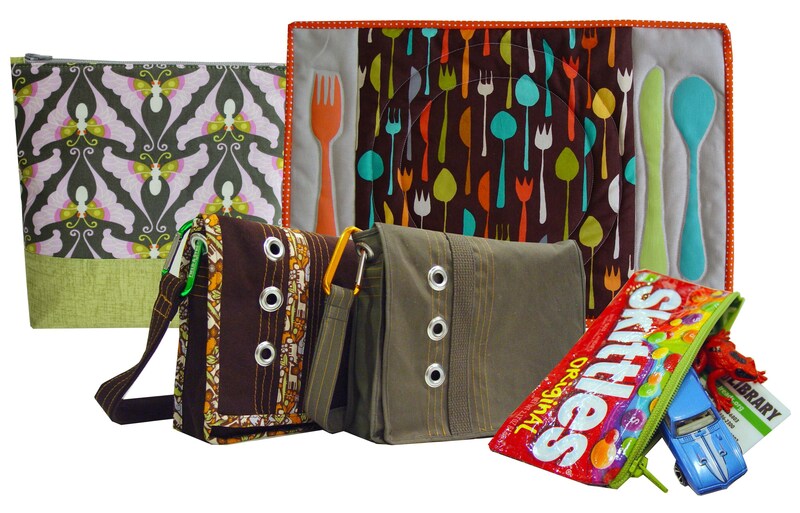 Practicing sewing on scraps or doing a simple project will help you learn how it feels. The manual will show all the stitches you can do with it and tell you when/how to use them. It will go through labeling what every part of the machine is and it’s function. 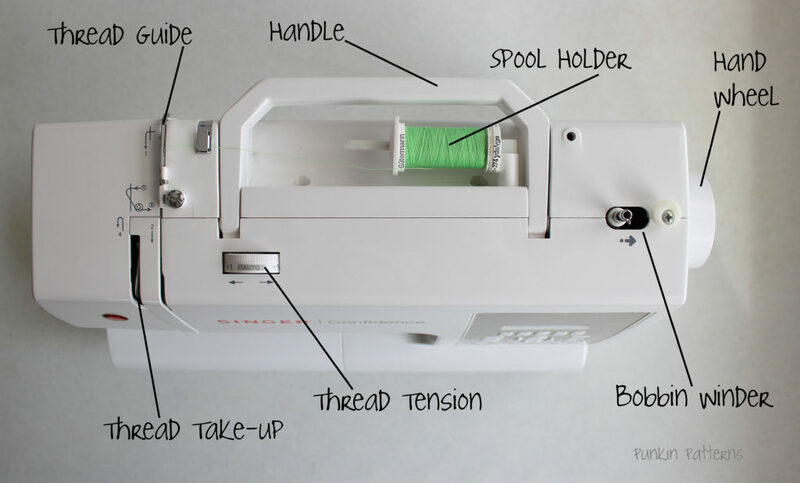 It will teach you how to thread your machine and how to find the right tension and how to clean and take care of your machine. Many manuals are available in PDF format online now, which is great if you ever loose the original copy or purchase a second hand machine that didn’t come with a manual. I hope you found this helpful. Happy Sewing! Very clear and I can’t wait to see the future posts. I can do fairly advanced stuff, but sometimes the very simple escapes me (like tying off when machine quilting). The “simple” stuff, is sometimes the most important. I’m excited for this series to continue! I am teaching my 7 year old granddaughter to sew. 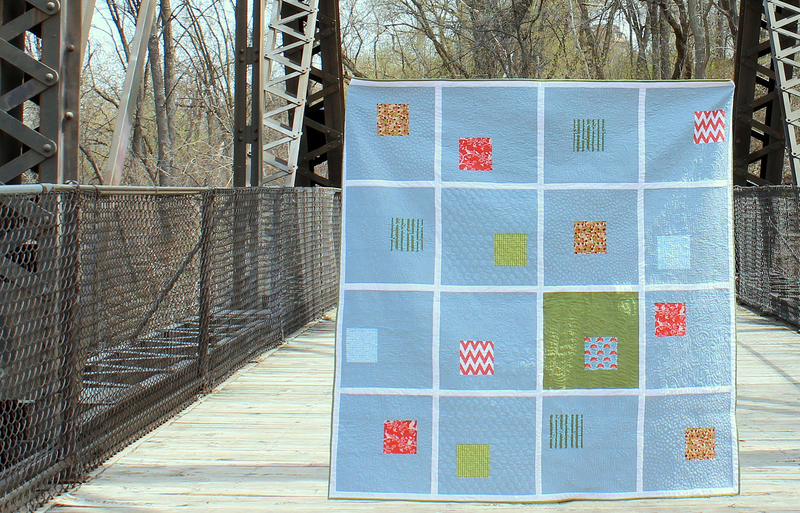 She wants to make a quilt and has sewn four 5″squares together to make a 9 1/2″ square. She is so excited. I bought, (which I will be giving to her for Christmas), a Brother XM2701, not computerized, easy to learn for beginners. By the way, I made her quite a few skirts using your easy skirt tutorials.